Echoes of pure elegance, style and grandeur. 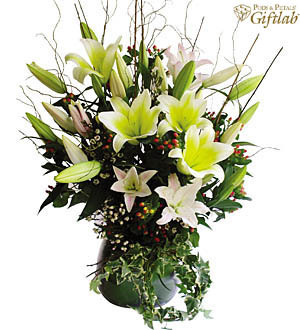 Halloween, Stargazers, Madonna Lilies and Berries in a stunning combination. Measures approx. 90cm. We only uses imported Lilies for all our arrangements. Depending on availability,other similar valued vases will be used. Vases may differ for outstation orders.